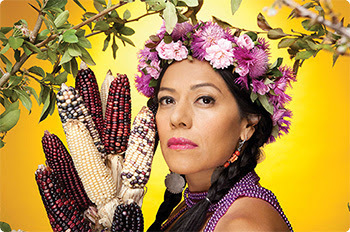 Lila Downs (pictured above) has a new album out -- it's called Balas Y Chocolate (Bullets & Chocolate), it's one of the best things I've heard this year, and you'll hear a song from it on this week's program. And there's more new music to go with Lila's: Balkan jams by Tipsy Oxcart and Taraf De Haidouks, salsa meets timba by Ola Fresca, cumbia from Rana Santacruz, chango-ska by Macaco (hey, he must be George Allen's favorite singer!) and The Very Best's Afro-electronica. Mazhar Ve Fuat | Turkuz Turku Cagiririz!